Who doesn't love a not-so-traditional resort arcade? We know our families love the variety of games available to kids of all ages. Foosball, pool table, air hockey, prize games, arcade games and more are all part of the scene on the resorts' activity level, and just inside from the grand outdoor pools. "Dad, we're going down to the game room!" yelled every kid on every vacation ever. That's because they love it. The good news is that there is something for everyone in our state of the art play room. Bad weather, no problem. You can actually ride snowmobiles in our game room. "Lets take the kids down to the game room and then head to the pool." Sound familiar? Of course it does. 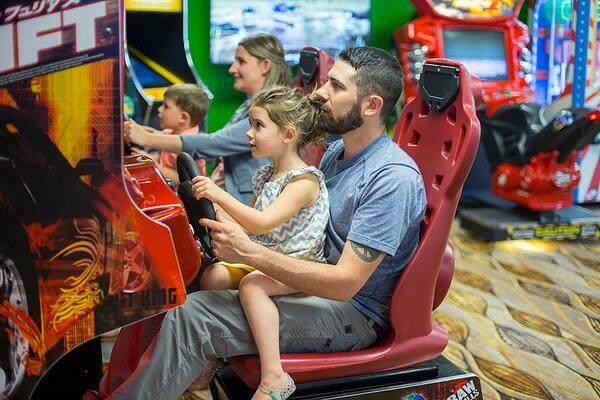 We understand that families need to keep their little ones occupied and our game room does just that. "Want to go shoot some pool?" Yes, please! Don't forget there are organized activities as well offered daily by our adventure concierge. Let us help you plan your next stay with us. We'll help you have fun. We'll make it extraordinary.